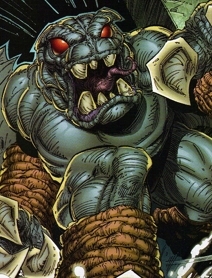 The Trog Monster was a creature that Thor released during his exile in Dimension-X as a means escaping a planet. It served as the god’s steed and got him to Glum World where Mister Glum defeated the Trog Monster before striking up a deal with Thor. The fate of the Trog Monster was not revealed.